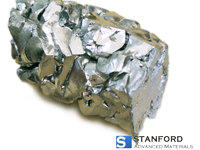 Stanford Advanced Materials (SAM) provides high purity zirconium crystal bars of outstanding quality. We have over 20 years of experience in working with such materials, making sure our clients’ needs and desires are met. We provide high purity zirconium crystal bars, usually with 1-2% hafnium (Hf) content, in two forms: one with low hafnium (250ppm, or 0.025%) or another with high hafnium. Both Zr and Hf share many properties and can be applied to the nuclear industries; however, they contain different properties in neutron capture. As a result, they must be separated through liquid extraction or distillation of molten salt. Both of these processes are expensive and can cause the market price for low Hf content zirconium to cost 50-100% more as compared to Hf zirconium. The high purity of zirconium crystal bars is much better than that of normal zirconium sponges, making them [crystal bars] ideal additives for specific special alloys and materials in the process of creating high purity zirconium sputtering targets. Zirconium crystal bars were also used for commercial purposes before the magnesium reduction process was developed. *Concentrations of other metal elements are too low to be determined. Stanford Advanced Materials also provides 702, 705 Zr materials in forms of tubes, sheets, rods, wire and customized shapes. Our high purity zirconium crystal bars are carefully handled to minimize damage during storage and transportation and to preserve the quality of our products in their original condition.